Instead, Hampl is intrigued by the kind of instinctual, floaty, aimless daydreaming that many of us — if we were lucky — indulged in for hours and hours as children. As adults, of course, we feel like we need to have something to show for our time: achievements, chores, to-do list items crossed off. Hampl wonders about what we miss when we no longer allow ourselves to simply get lost in thought. Her sharp and unconventional book — a swirl of memoir, travelogue and biography of some of history's champion day-dreamers — is its very own Exhibit A, making the case for the profound value of letting the mind wander. Hampl kicks off her excursion into the interior life by genuflecting at the shrine of one of its greatest proponents, Michel de Montaigne, the 16th-century French philosopher who's been having a "moment" ever since Sarah Bakewell's 2010 book on him, How To Live, became a surprise hit. Montaigne, who's often hailed as the first "modern" thinker, retreated to a cold stone tower in his late 30s to sit in solitude and muse on life and death, occasionally writing down his wayward thoughts. By accident, along the way, he invented the first-person essay — which is also the form that Hampl has embraced in her memoirs and other nonfiction books. When she describes the movement of Montaigne's essays, the way they capture the "inner tick-tock of thought," she's also describing the way her own writing works. There's no overarching narrative to The Art of the Wasted Day; rather, Hampl gives us vivid sparks of memory: skating, as a girl, arm in arm with her friends, and suddenly realizing that, unlike them, she didn't want children; pausing, as an adult, on the landing outside Sigmund Freud's flat in Vienna, and having the sensation that "just here, on the turn of the stone landing, his patients must have stopped too, pivoting from the session back into their ... lives." Unlike stories, these small moments or "vignettes", as Hampl says, lead us "down the rabbit hole of thought." That sounds self-indulgent, but Hampl is such an incisive writer, a reader comes to trust that those rabbit holes are worth tumbling down into. Like Montaigne, Hampl is a writer who's at her best when she's simply sitting still. Inevitably, while she does so, her thoughts keep returning to the other presiding presence in this book: her late husband. They met decades ago when both were renting apartments in F. Scott Fitzgerald's grandmother's chopped up row house in Hampl's native St. Paul, Minn. She describes their life together as an accumulation of years of sitting at their yellow kitchen table, talking aimlessly over coffee. Then she stops herself. After her husband's death, Hampl says, "I [became] allergic to widow books, determined never to write one. Though — look at me." The final chapter of The Art of the Wasted Day is about a "long, dreamy" boat trip through the waterways of the Midwest that Hampl and her husband once took in their little cabin cruiser. Hampl, the world traveler, says it was the most memorable trip of her life. The way she writes about it is pretty memorable, too. In fact, it's a knockout about time and the river, about loss, and, as Hampl says, about those small insubstantial moments out of the past that are "made substantial sheerly by virtue of [their] indelibility." Like most of the rest of this odd and haunting book, it's impossible to do justice to the cumulative power of Hampl's dream-weaver writing style by just quoting a few lines. You have to go on the whole voyage with her, take the detours, be willing to let yourself get becalmed in thought. The payoff — because, of course, we're all still looking for a payoff — is that by wasting some of your time with Hampl, you'll understand more of what makes life worth living. This is FRESH AIR. Our book critic Maureen Corrigan has a review of a new book by Patricia Hampl, an award-winning essayist and memoirist known for books like "A Romantic Education" and "The Florist's Daughter." Her new book is also part memoir, in this case about a subject that few other writers have attempted to capture. Here's Maureen's review. MAUREEN CORRIGAN, BYLINE: Patricia Hampl, you had me at your title - "The Art Of The Wasted Day." Imagine a book that celebrates daydreaming, seeing it not as a moral failing but as an activity to be valued as an end in itself. To be clear, this is not a self-help book, nor is Hampl talking about meditation, yogic breathing or mindfulness, those worthy New Age practices that, well, have to be practiced. Instead, she's intrigued by the kind of instinctual, floaty, aimless daydreaming that many of us, if we were lucky, indulged in for hours and hours as children. As adults, of course, we feel like we need to have something to show for our time - achievements, chores, to-do list items crossed off. Hampl wonders about what we miss when we no longer allow ourselves to simply get lost in thought. Her sharp and unconventional book, a swirl of memoir, travelogue and biography of some of history's champion daydreamers, is its very own exhibit A making the case for the profound value of letting the mind wander. Hampl kicks off her excursion into the interior life by genuflecting at the shrine of one of its greatest proponents, Michel de Montaigne, the 16th-century French philosopher who's been having a moment ever since Sarah Bakewell's 2010 book on him, "How To Live," became a surprise hit. Montaigne, who's often hailed as the first modern thinker, retreated to a cold stone tower in his late 30s to sit in solitude and muse on life and death, occasionally writing down his wayward thoughts. By accident, along the way he invented the first-person essay, which is also the form that Hampl has embraced in her memoirs and other nonfiction books. When she describes the movement of Montaigne's essays, the way they capture the minute-to-minute inner tick-tock of thought, she's also describing the way her own writing works. There's no overarching narrative to "The Art Of The Wasted Day." Rather, Hampl gives us vivid sparks of memory - skating as a girl arm in arm with her friends and suddenly realizing that, unlike them, she didn't want children, pausing as an adult on the landing outside Freud's flat in Vienna and having the sensation that, just here on the turn of the stone landing, his patients must have stopped too, pivoting from the session back into their lives. Unlike stories, these small moments - or vignettes, as Hampl says - lead us down the rabbit hole of thought. That sounds self-indulgent. But Hampl is such an incisive writer, a reader comes to trust that those rabbit holes are worth tumbling down into. Like Montaigne, Hampl is a writer who's at her best when she's simply sitting still. Inevitably, while she does so her thoughts keep returning to the other presiding presence in this book, her late husband. They met decades ago when both were renting apartments in F. Scott Fitzgerald's grandmother's chopped-up row house in Hampl's native St. Paul. She describes their life together as an accumulation of years of sitting at their yellow kitchen table, talking aimlessly over coffee. Then she stops herself. After her husband's death, Hampl says, I became allergic to widow books, determined never to write one - though look at me. The final chapter of "The Art Of The Wasted Day" is about a long, dreamy boat trip through the waterways of the Midwest that Hampl and her husband once took in their little cabin cruiser. Hampl, the world traveler, says it was the most memorable trip of her life. The way she writes about it is pretty memorable too. In fact, it's a knockout about time and the river, about loss and, as Hampl says, about those small insubstantial moments out of the past that are made substantial sheerly by virtue of their indelibility. Like most of the rest of this odd and haunting book, it's impossible to do justice to the cumulative power of Hampl's dream-weaver writing style just by quoting a few lines. You have to go on the whole voyage with her, take the detours, be willing to let yourself get becalmed in thought. The payoff - because, of course, we're all still looking for a payoff - is that by wasting some of your time with Hampl, you'll understand more of what makes life worth living. GROSS: Maureen Corrigan teaches literature at Georgetown University. 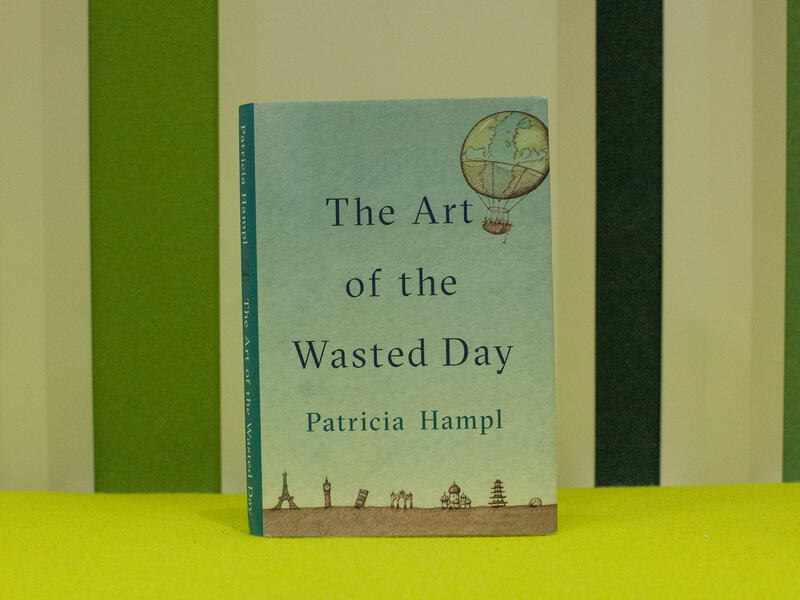 She reviewed "The Art Of The Wasted Day" by Patricia Hampl. Tomorrow on FRESH AIR, my guest will be David Kertzer, who won a Pulitzer Prize for his book, "The Pope And Mussolini." His new book, "The Pope Who Would Be King," is about Pope Pius IX, who became pope in 1846 and ruled over the Papal States. He instituted the doctrine of papal infallibility and saw progress and freedom of speech as anti-Catholic. His exile led to the emergence of modern Italy. I hope you'll join us. (SOUNDBITE OF CJ PEETON'S "WEIRD NATURE") Transcript provided by NPR, Copyright NPR.